Joseph Culpepper married Nicey Yarborough on 10 Aug 1843 in Marengo Co., Alabama. Joseph Culpepper married Nicy Yarborough on 10 Aug 1843 in Marengo Co., Alabama. Tod Culpepper, 2, M, MS.
Emma G. Culpepper, May 23, 1850 - July 3, 1924. J. M. Culpeper, 41, M, Farm Laborer, RE=$0, PE=$700, GA. Biography* � Simeon, Jr., was listed in the household of Henry Culpepper in 1850, and so is presumed to have been his son. H. Culpepper, 1 M0-5, 1 M30-40, 2F 0-5, 2 F5-10, 1 F20-30. Emilia Henderson, 18, F, SC. 1840 Census 1 Jun 1840� Martha was probably a free white female, age 10 and under 15, in Simeon Culpepper of Lauderdale Co., MS's household, on the 1840 Census on 1 Jun 1840 at Lauderdale Co., Mississippi. Simeon Culpepper, 1 M0-5, 2 M10-15, 1 M15-20, 1 M30-40, 1 F0-5, 1 F20-30. Simpson Culpepper, 1 M0-5, 1 M5-10, 1 M10-15, 2 M15-20, 1 M20-30, 1 M40-50, 2 F5-10, 1 F10-15, 1 F40-50, 0 slaves. Marriage was probably in Lauderdale Co., MS, but marriage records for 1845 to 1850 are missing. But "History of the Liberty Baptist Church -- Sumter County, AL," published by the Lauderdale County MS Department of Archives and History, p. 36, Feb 1850 mentions that Ira Buckalew and Martha his wife were granted letters of dismission. Source: Ruth Cohlmia. Correspondence from Ruth Cohmia to Lew Griffin, 2000. Lauderdale Co., MS Court Docket 1852 -- 1855 p. 409, as transcribed by Ruth Cohlmia. Lauderdale Co., MS Probate Court Minutes, Book G, p. 163, August Term 1856, as transcribed by Ruth Cohlmia. 1840 Census 1 Jun 1840� William was probably a free white male, age 10 and under 15, in Simeon Culpepper of Lauderdale Co., MS's household, on the 1840 Census on 1 Jun 1840 at Lauderdale Co., Mississippi. Ambrose Culpepper, 20, M, Farmer, GA.
William Culpepper married Ellen Culpepper on 5 Apr 1851 in Sumter Co., Alabama. + Willie Ann Culpepper, Feb. 1862 - Nov. 1922. Gertrude Culpepper, 8/12, F, MS.
William Culpepper voted at Woods, Sumter Co., AL, on 6 Nov 1861. William Culpepper, died 29 Mar 1864, Served as Private in Co. C, 40th Alabama Regiment. Interred in Rock Island National Cemetery, Moline, IL, Section A, Site 945. Matthew McMurray, Nephew, M, Sng, Wh, 1, N/A, MS/MS/MS. E-mail written 2000 to Culpepper Connections from Louise G. Stratton, 13802 N. 108th Drive, Sun City, AZ 85351, e-mail address (Nov 2008). 1840 Census 1 Jun 1840� Owen was probably a free white male, age 5 and under 10,in Simeon Culpepper of Lauderdale Co., MS's household, on the 1840 Census on 1 Jun 1840 at Lauderdale Co., Mississippi. Owen J. Culpepper, Pvt, Co.C, 40th Inf. Enlisted 27 Mar 1862 Sumter Co, AL Capt W. A. C. Jones. O.J. was captured at Vicksburg and paroled 09 Jul 1863; reported missing after Battle of Lookout Mt. 24 Nov 1863 Owen J captured at Chattanooga and sent to Rock Island,IL, paroled Prisoners of War, 09 May 1865 Citronelle, AL. Theodicia Culpeper, 1, F, AL. Owen Culpepper, Lauderdale Co., MS, 1853. Owen J. Culpepper and Nancy Honeycutt married 5 Jan 1858 in Lauderdale Co., MS.
Parelle Culpepper, 12, F, Wh, MS.
Nancy C. Culpepper, Boarder, F, Wh, 73, Wd2, ch 5/2, TN/TN/TN. 1840 Census 1 Jun 1840� Henry was probably a free white male, under 5 years old, in Simeon Culpepper of Lauderdale Co., MS's household, on the 1840 Census on 1 Jun 1840 at Lauderdale Co., Mississippi. "H. P. Culpepper married Aseneth Blann on Nov 19, 1853 in Sumter Co., Alabama." C. Culpeper, 25, F, AL. + George Clarence Culpepper, Apr. 8, 1861 - Oct. 29, 1883. H. P. Culpepper voted at Rosserville, Sumter Co., AL, on 5 Aug 1861. Martha Moody, 17, F, Black, Cook, AL. Judus Studevin, Other, M, sng, Black, 17, Works On Farm, AL/AL/AL. H. P. Culpepper married Annie Mariah Jones on 19 Jan 1881 in Sumter Co., Alabama. Joseph F. Stegall, compiler, Sumter County Alabama: Index to Wills, Register of Deaths, and Cemetery Records, Bowie, MD: Heritage Books, 1997, Repository: LDS Family History Library - Salt Lake City, Call No. US/CAN Books 976.141 V3s. Anselum Culpepper, "Died 13 Oct 1883 in Sumter Co., Alabama". Published 26 Oct 1883, Vol. 4, page 404. George C. Culpepper, White, born in Alabama, died 27 Oct 1883 at age 24 of Typho-malarial fever. Buried in Thornville. Minnie Dorough, niece, Wh, F, Nov. 1880, 19, S, AL/MS/AL. William B. Odom, Grandson, M, Wh, 13, S, MS/MS/AL. Ann M. Culpepper, Lodger, F, Wh, 79, md, AL/AL/AL. 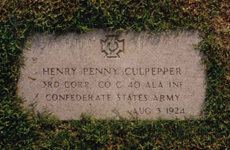 Henry P. Culpepper died Aug 1924 in Chilton Co., Alabama. Benjamin D. Roberts, compiler, Cemeteries of Chilton, Clanton, Alabama: Mail Specialist, 198_, Repository: LDS Family History Library - Salt Lake City, Call No. US/CAN 976.181 V3c. + H. P. Culpepper, died 3 Aug 1924, Corporal, Co. C, 40th AL Infantry Regiment. Annie M. Culpepper died Aug 1926 in Sumter Co., Alabama. John Culpeper, 18, M, Farm Laborer, AL. J. C. Culpepper and Sarah J. Ranier married 23 Jan 1861 in Lauderdale Co., MS.
+ Sarah Elizabeth Culpepper, 27 Jul 1872 - 18 Aug 1934. Owen Judson Culpepper, 523 13th Ave, Meridian, Lauderdale Co., MS, Age 43, Born 4 Jun 1875, White, Salesman for Meridian Coca Cola Co. at Meridian, Lauderdale Co., MS. Nearest relative: Ardell Culpepper, 523 13th Ave, Meridian, Lauderdale Co., MS, /s/ Owen Judson Culpepper, Medium height, Slender build, Blue eyes, Dark brown hair, No disabilities. Registered 12 Sep 1918 in Meridian, Lauderdale Co., MS.
O. J. Culpepper, Son, M, Sng, Wh, 5, At Home, MS/MS/AL. Sarah J. Culpepper, Wife, Wife, Wh, F, Mar 1842, 58, Md-40 yrs, ch 5/4, MS/TN/TN. Sallie S. Culpepper, Wife, F, Wh, 68, m1-50 yrs, ch 5/4, MS/TN/TN. + M. A. Culpepper, Jan. 28, 1830 - June 11, 1880. Joel Culpepper, 1 M0-5, 1 M5-10, 1 M20-30, 2F 0-5, 1 F20-30. Elmira Culpepper, 5, F, MS.
Ambrose H Culpepper, issued 2 Jul 1860, Choctaw Meridian, Lauderdale Co., MS, Twp 6-N, Rng 18-E, Sec 26. Tom Culpepper, Other, M, Sng, Black, 5, N/A, MS/---/MS. Ambrose Culpepper and Emma Woods married 4 Nov 1880 in Lauderdale Co., MS.
Margrette Culpepper, Dau, F, 10, S, MS MS MS.
Margaritte Culpepper, Daughter, F, Wh, 5/12, S, MS/MS/MS. Obituary of Samuel Bluett Culpepper III, published 18 Oct 1992 (page 37). Margurite Culpepper, Dau, F, 20, S, MS MS MS.
Samuel B. Culpepper Sr., died 23 Aug 1950 in Johnson Co., TX. Margaret S Culpepper, Female, died 5 Apr 1975 in Johnson Co., TX. Hubert Culpepper and Sarah Boswell married 20 Dec 1855 in Lauderdale Co., MS.
Hewbert Culpepper voted at Woods, Sumter Co., AL, on 3 Mar 1856. Eleanor Culpepper, 2, F, MS.
Hubert Culpepper, St Stephens Meridian; Sumter Co., AL; 80.11 Acres; Issue Date: 20 May 1862; Land Office: Montgomery; Authority: 20 May 1862: Homestead Entry Original (12 Stat. 392); Document Nr. : 7414; Accession/Serial Nr. : AL4760__.209; Aliquot Parts: E½NW; Sec 28; Twp 16-N; Rng 4-W.
E-mail written Apr 2011 to Warren Culpepper from Donald Eugene Larkin (gtgs/o #2519), e-mail address. Italie F. Culpepper, 2, F, Wh, AL. Elbert Marvin Culpepper, 1623 16th Ave, Meridian, Lauderdale Co., MS, Age 45, Born 18 Oct 1872, White, Occupation: Illegible, Front St., Meridian, Lauderdale Co., MS. Nearest relative: Mrs. Carrie Culpepper, 1623 16th Ave, Meridian, Lauderdale Co., MS, /s/ Elbert Marvin Culpepper, Medium height, Slender build, Brown eyes, Salty hair, No disabilities. Registered 12 Sep 1918 in Meridian, Lauderdale Co., MS.
Elbert Culpepper, Son, M, sng, Wh, 7, At School, AL/GA/AL. Carrie B. Culpepper, Dau-in-Law, Wh, F, July 1879, 20, Md-1 yr, ch 0/0, MS/AL/MS. Hubert Culpepper, Father-in-law, M, Wh, 74, Wd, MS/AL/AL. Mathew Culpepper and Mary Etta Boswell married 1 May 1860 in Lauderdale Co., MS.
Mantilla Culpepper, 4, F, AL (Dau of Hubert and Sarah). + Mathew Culpepper, Co. C 40 Ala. Inf., C.S.A (No Dates). Tom Moore, Boarder, M, 1845, 55, S, UN/UN/UN, Day Laborer. Catherine V. Culpepper, 1, F, Wh, MS.
Vernon Culpepper, GSon, M, Sng, Wh, 10, N/A, MS/---/MS. Harbin Culpepper and Nancy E. Culpepper married 9 Dec 1858 in Lauderdale Co., MS.
Nancy Culpepper, 21, F, Dom. Bus, MS.
Loy Simpson Culpepper, Toomsuba, Lauderdale Co., MS, Age 39, Born 27 May 1879, White, Painter for AGS RR. Nearest relative: Eugenia Culpepper, Wife, Toomsuba, Lauderdale Co., MS, /s/ Loy Simpson Culpepper, Short height, Slender build, Blue eyes, Black hair, No disabilities. Registered 12 Sep 1918 in Lauderdale Co., MS.
Ellar Culpepper, niece, Wh, F, Feb 1864, 36, S, MS/MS/MS. Dock Culpeper, 13, M, AL. + Mary Culpepper, Dec. 19, 1841 - May 20, 1913. Hardin Culpepper and Mary L. Goodwynn married 1 Nov 1860 in Lauderdale Co., MS.
Anna Culpepper, 1, F, Wh, MS.
John Rainer, Cousin, M, Sng, Wh, 23, Farm Laborer, MS/TN/GA. 1840 Census* 1 Jun 1840� Owen was listed as the head of a family on the 1840 Census on 1 Jun 1840 at Lauderdale Co., Mississippi. Research note 14 Jan 2006� Joel Culpepper is presumed to have been a legatee in Joseph Culpepper's 1816 will in Jackson County, GA, as an equal devisee, but was not mentioned by name. Jackson County estate records from the period should be extant, and should be checked for a division of land, a final settlement of the estate, etc, for a list of the names of all of Joseph's children. This might be available from the Georgia Archives, or possibly from the Jackson County courthouse. Until those documents, if any, can be located, one might ask what evidence there is for the various children of the Joseph Culpepper who died in Jackson County in 1816? Only three children were mentioned in his will, Simeon, Henry, and Sally. And yet he is thought to have had eight or more children. Those other children are all based for now, as far as this writer knows, on circumstantial evidence. For example, Joseph's two daughters other than Sarah are attributed to him due to their marriage in Jackson County. Marriages were recorded in the bride's county of residence, and at the time of their marriage there was no other Culpepper family in the county other than the children and widow of Joseph Culpepper. These daughters also appear as check marks on the 1820 Jackson County census record for Joseph's widow Nancy. Likewise, the 1820 census indicates that Nancy, widow of Joseph, had four sons living at home, presumed to be Henry, Owen, Joel, and John, who all show up in Jackson County records after 1820, when no other Culpepper family was living in the county. The eldest son, Simeon, a known son from Joseph's will, was himself a head of household in 1820 in Jackson County, Georgia. It is not clear to this writer which, if any, Jackson County Tax records have survived during the period 1809 to 1836. But if these records are extant, they should be checked for any Culpeppers mentioned. Since 1809 is extant, and available on the Internet, later years mght be available as well. I would suggest contacting the Georgia Archives or the Jackson County Courthouse. Sometimes the tax digest records can be used to establish relationships. One should note that Joseph Culpepper, the presumed father of Joel, was the only Culpepper whose family stayed in Jackson County over a long period of time. The only other Culpeppers who left an early trace in the county were Malachi Culpepper, who had an early grant there; a Sampson Culpepper, who lived there during 1808 - 1818, and Allison Culpepper, who is mentioned in a couple of deeds. The tax records mentioned above, if any have survived, might pinpoint the exact few years that Allison was there. Let us begin by noting the earliest proven record of Joel Culpepper in Jackson County. This was his marriage to Amelia / Milly Yarbrough there on 25 Dec 1823. We know that she was the daughter of Joseph Yarbrough (brother of the Rev. Ambrose Yarbrough) and that Joseph and Ambrose were the sons of Jonathan Yarbrough of Anson County, NC (sources can be provided). Note the Yarbrough family connection, as it will be a theme throughout what follows. This 1823 marriage suggests, at least that Joel Culpepper was a resident of Jackson County, since he married a resident of the county, or else he was from a nearby county. But given the rarity of the Culpepper surname, there were no Culpeppers in any of the surrounding counties at that time. So this particular Joel Culpepper was probably from Jackson County. It was there, at least, that he met and married his bride. There were several Joel Culpeppers from this time period, all related. The reader must allow me, in the interest of time, to rule out all but two of them. Other than these two who had connections to Jackson County, all the others can be shown to have married someone other than Amelia / Milly Yarbrough, and can be shown to have left records elsewhere than in Jackson County during the time period in question. As mentioned above, a Sampson Culpepper was living in Jackson County during 1808 - 1818, and he had a son named Joel, born circa 1800. Sampson moved back to Laurens County, GA in 1818, taking his young children with him, including Joel. Sampson appeared on the 1820 census in Laurens County, and a check for son Joel was included in his household. He left a will there in 1822, probated in 1823, mentioning his son Joel. This Joel can only be identified as the Joel Culpepper who moved to Illinois and left descendants there, including a Joel Culpepper Jr. who died in the Mexican War. While this Joel was only three years older than the Joel who married Ameila Yarbrough, and while he lived in Jackson County, Georgia from 1808 to 1818, as will be shown below, it is easy to distinquish the two Joels from each other. One was closely associated with the children of Joseph (died 1816) and the other (who moved to Illinois) was not. The 1820 census "checks" showing family members, when compared to wills, distinguish this Sampson of Jackson and Laurens Counties, from the Sampson of Wilkinson County, GA, who is beyond the immediate scope of this discussion. Since we know the Joel Culpepper who married Amelia / Milly Yarbrough was not the son of Sampson Culpepper, who lived in Jackson County from 1808 to 1818, then what are the other possibilities? Malachi Culpepper had a Revolutionary War grant in Jackson County, but it is unclear if he ever lived there. He was probably a brother of Joseph Culpepper (died 1816) and Malachi had a son named Joel, who is well documented in Coweta County, GA records. So we have at least briefly mentioned all the early Culpeppers in Jackson County, with the exception of the family of Joseph Culpepper who died there in 1816. And we have shown that by process of elimination, the Joel who married Amelia Yarbrough must have been the son of Joseph Culpepper of Jackson County, as there are no other reasonable possibility. All other Joel Culpeppers from the time period can be otherwise accounted for. So that raises the question, other than the process of elimination, is there any positive evidence to support the theory that this particular Joel was the son of Joseph of Jackson County? And the answer is yes. To summarize the main points briefly, Joel can be shown to have moved to the Sumter / Lauderdale County area of AL / MS at the same time as the known sons of Joseph: Simeon and Henry: and brother Owen Culpepper as well. Each of these other brothers named a son Joel. Most of the brothers intermarried with the Yarbrough family, which also moved to this area from Jackson County at the same time. And most of the four brothers mentioned had sons or daughters who married their first cousins, the sons and daughters of the other brothers. Nancy Culpepper, 2 M10-16, 1 M16-18, 2 M16-26, 2 F0-10, 1 F10-16, 1 F16-26, 1 F26-45. Owen Culpeper and Mary Everett on 17 Dec 1827 in Hall Co., GA.
M. H. Culpepper and Martha Highfill on 31 Dec 1865 by S. G. Davis, J.P. in Hall Co., GA, Book A-458. Bennie and Lance White, compiler, White's Store.com, Bennie W. White, Jan 1999. Note: A now unknown cemetery source says that Philip was born 22 Aug 1832, Sallie was born 15 May 1844 and died 5 Jan 1909, and that both were buried in Stonewall Cemetery. Owen Culpepper, 1 M0-5, 1 M15-20, 1 F0-5, 1 F20-30. Jackson County, GA Deed Abstracts, Books E-L, 1808-1843, transcribed by Lewis W. Griffin from LDS Film (#376,992, 325,695-7): Deed Book K, page 19. Owen Culpepper, Lauderdale Co., MS, 1841 & 1845. Owen Culpepper, owned 1 Black female, age 15. Owen Culpepper, Lauderdale Co., MS, 1853, 2 free males, 6 free females. O. Culpepper, owned 4 Black females, ages 23, 5, 3, and 2. Joel Culpepper, 17, M, Farm Labor, MS.
John Russ, 13, M, Wh, Attending school, GA.
1840 Census 1 Jun 1840� Mary was probably a free white female, age 30 and under 40, in Owen Culpepper of Lauderdale Co., MS's household, on the 1840 Census on 1 Jun 1840 at Lauderdale Co., Mississippi. Census 1853� Mary, Rebecca, Perlina and Nancy was probably a free female in Owen Culpepper of Lauderdale Co., MS's household on the census taken in 1853 at Lauderdale Co., Mississippi. 1840 Census 1 Jun 1840� Phillip was probably a free white male, age 10 and under 15, in Owen Culpepper of Lauderdale Co., MS's household, on the 1840 Census on 1 Jun 1840 at Lauderdale Co., Mississippi. P. P. Culpepper, Lauderdale Co., MS, 1853, 2 free males, 3 free females. + James B. Culpepper, 5 Feb 1857 - 27 Oct 1926, "Father, With Christ in Heaven"
+ Ida O. Culpepper, 2 Mar 1866 - 24 Apr 1912 "Mother, She died as she lived - a Christian." E. Jones, 21, M, Laborer, AL. + Martha Ella Culpepper, 18 Feb 1868 - 17 Feb 1951. Thedosia Colpeper, 11, M, Wh, AL. Lucy Culpepper, Dau, F, Sng, Wh, 4, N/A, MS/GA/NC. P. P. Culpepper, Son, Wh, M, Jan. 1864, Wid, AL/GA/NC, Farmer. Census 1853� Sarah and Cecila was probably a free female in Phillip Pinkney Culpepper's household on the census taken in 1853 at Lauderdale Co., Mississippi. E-mail written 2003 to Lew Griffin from Christine Grimes Thacker, e-mail address. Maretta Culpepper, Mother-in-law, Wh, F, March 1852, 58, Wid, ch 4/3, MS/GA/GA. John Culpepper, Son, Wh, M, Sept. 1872, 27, S, MS/MS/MS, Farm Laborer. Michael Vance, 14, M, butcher(? ), Ireland. Leona E. Culpepper, 11, F, MS.
W. S. Culpeper and Armurita Price married 7 Jun 1866 in Lawrence Co., MS.
Pascall Culpepper, 6/12, M, Wh, MS, born Dec 1869. Viola Culpepper, Dau, F, Sng, Wh, 2, N/A, MS/MS/MS. 3 Aug 1882, one grant: Rng 13-W, Sec 24. Thomas Samuel Culpepper, Lyman, Harrison Co., MS, age 35, born 12 Oct 1882, White, Sawyer for Ingram Day Lumber Co. at Lyman, Harrison Co., MS. Nearest relative: Pauline Culpepper, Lyman, Harrison Co., MS, /s/ Thomas Samuel Culpepper, Tall height, Medium build, Brown eyes, Blond hair, No disabilities. Registered 12 Sep 1918 in Gulfport, Harrison Co., MS.
Leona E. Cullpepper and Seaborn C. Buckley married 13 Oct 1869 in Lawrence Co., MS.